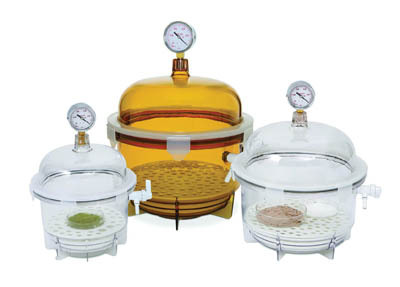 High-quality vacuum desiccators provide vacuum integrity lasting three times longer than the average vacuum desiccator resulting in lower maintenance and greater peace of mind. Able to maintain 29in.-Hg vacuum for over 72 hours at room temperature, they stay gastight allowing reliable storage or experiments over extended periods. A Viton™ 3-way valve offers consistent and uniform vacuum draw, vacuum release, or gas exchange. Transparent polycarbonate construction is durable, easy-to-clean, chemical-resistant, and allows quick visualization of the desiccator contents. Amber tinted UV blocking models block 100% of UVA, B, and C light to minimize damages or discoloration of light-sensitive samples. Use with any vacuum with free air capacity of 1.5 cubic feet per minute (CFM) ft or greater.